There’s this girl and this guy. They’re engaged to be married. And then the girl has this weird dream with an angel in it. She’s pregnant, apparently, with the child of God. A couple of days later, the guy has a similar dream, in which he’s told that, yeah, it’s not his kid, but he should raise it anyway. Turns out she is pregnant. They don’t know how to explain it. And when the kid’s born—in a barn, of all places—people keep showing up, saying angels, stars led them there. The king wants the kid dead. And all the couple can do is watch and listen and hope. I don’t really believe this anymore. I believe there was a Jesus, yeah, and I believe a lot of the things he said were pretty smart ideas for how to lead your life. But the whole “heavenly messengers”/“virgin birth” thing doesn’t really work for me. Probably, the guy got the girl pregnant. Probably, they came up with a story to cover it up. Even more probably, the whole thing was shoved on top of the story of a spiritual leader who’d died, to make his initial origins more mythic and make him seem more like who his followers claimed him to be. I don’t believe in the Christmas story, but I still think it’s true. Charles Schulz is right there with me. A secular humanist, especially later in his life, Schulz stuck a religious message into the climactic moment of A Charlie Brown Christmas because he wanted to remind the world that all of the hubbub of Christmas has sprung up around a holiday with a solemn religious meaning, according to his biographer, David Michaelis, in Schulz And Peanuts: A Biography. When Charlie Brown makes the plea, “Isn’t there anyone who knows what Christmas is all about?” it’s a literal plea, within the context of the story. It’s not that Charlie Brown doesn’t know (he’s in the process of directing a staged version of the Christmas story, for God’s sake), but he needs to be reminded, needs to be taken back to the roots, to a place where Christmas is about something with meaning, something other than noise and gifts and commercial pap, something about two scared kids and a baby on the way and a clear night when all things seem possible. 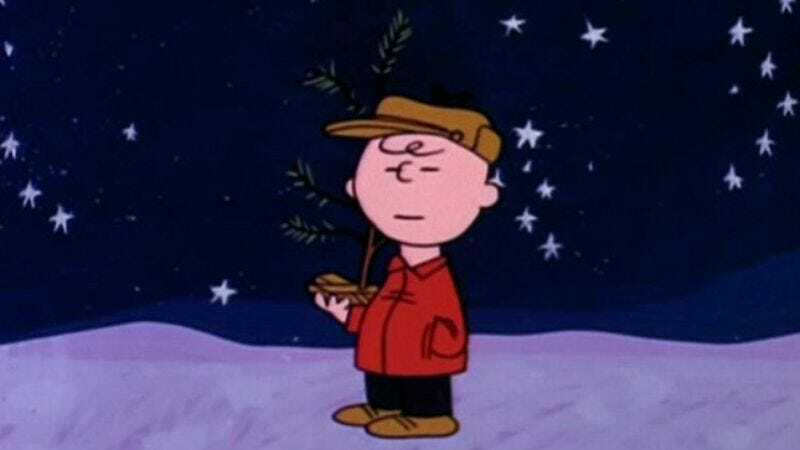 It’s the Linus speech that both makes Charlie Brown Christmas divisive—I’ve talked with non-Christian friends who can’t stand this special—and makes it so great. It’s a moment of honest, heartfelt emotion in a form—the televised Christmas special—that seems designed to beat all honesty out of anything that comes in contact with it. The story of how this thing got on the air over numerous network objections—to the jazz score by Vince Guaraldi, to the idea of having real kids do the voices of the Peanuts kids, to the Linus speech—has nearly become legend, but the combination of lack of time and Schulz’s clout within the pop culture of the mid-’60s led to the whole thing getting on air pretty much exactly as Schulz wanted it, weird little-kid voices and jazz riffs intact. For better or worse, A Charlie Brown Christmas seems to be about as much of a glimpse into one man’s brain as television allows, or at least it would allow until Louie came along. That’s not to discount the strong work by the many other great TV minds involved in the special. The production team of Lee Mendelson and Bill Melendez (who also directed) did a tremendous job of making sure Schulz’s ideas made it to the screen intact. Melendez’s colors in the special aren’t realistic so much as they are suggestive, the familiar Peanuts characters shuffling along in front of backgrounds that seem to create a kind of dream-like world, more than anything we might recognize as our own reality. (This is most evident in the final sequence at Snoopy’s doghouse and in the scene where Charlie Brown and Linus go to the Christmas tree lot, which seems at once over-populated—thanks to the bright lights flashing—and under-populated, because there’s nobody else there.) The two took what might strike many as flaws that could never be overcome—like a tight production schedule that didn’t allow for sophisticated animation and caused several ragged edges in certain scenes—and made them seem like virtues. It increases the sense the special has of being constructed on somebody’s kitchen table on the coldest, snowiest day of the year. It’s a labor of love for all involved, an attempt to beat back the sort of creeping Christmas commercialism that fuels the very medium it was produced for from October through January. Yet there’s still that unfiltered quality, that sense that this is a rambling sketch one man is telling to us pretty much off the cuff. Schulz wrote this thing over a long weekend, and it more or less shows. I’ve seen A Charlie Brown Christmas several dozen times in my life—it’s the one special I make time for every year—but this is the first time I’ve attempted to look at it critically at all, to dig around in my love for the thing and figure out just what makes it tick. What surprised me is just how plotless it is. It’s basically a series of vignettes about little kids at Christmastime, only those little kids are driven by adult anxieties. It’s not a new observation that Schulz used his child protagonists to express adult fears, but what always struck me about this special in particular is the way that Charlie Brown’s supposedly adult anxieties still resonate with how we feel as children. Granted, few kids complain about the commercialism of Christmas (or even understand it) when they’re that young, but every kid on earth can identify with trying to do something and continually failing or with hoping to impress everyone and having them laugh at you instead. Schulz’s world lacks adults because the presence of them would restore the sort of order that goes missing when Charlie Brown is mocked, but also because having adults there would rob the special (and the comic strip itself) of the sense that when we come up against crippling self-doubt, we’re all reduced to little kids, hoping against hope that someone will toss us a lifeline. The special works because it pulls all of these snapshot moments of a child’s December together into the scene with the Linus speech. The speech has been co-opted by evangelical Christians, of course, who see the continued ratings success of this special as a kind of validation of keeping Christ in Christmas, or what have you. That makes their preferred reading of it—as a kind of triumph of scripture over man’s uncertainty—the default reading for many. But looked at with what Michaelis claims to be Schulz’s original intentions in mind, the final scenes of the special take on another feeling entirely. If the Christmas story is about God’s grace toward humanity, about the idea that God would grant us someone meant to pull us toward the light and choose the most unlikely vessel to birth him, A Charlie Brown Christmas is about what happens when humans extend that grace toward each other. Linus’ speech—which sure seems to be the passage he worries about memorizing earlier in the special—comes out exactly right because he’s trying to help his friend see past the glossy trappings foisted on the holiday by society to the smaller, more beautiful core of hope, love, and longing. Charlie Brown’s winter’s-night walk afterward grants him a kind of serenity, because he no longer cares about making anything perfect and, instead, cares about seizing back the holiday for himself. The kids’ attempts to fix the tree make a kind of miracle—a perfect evergreen standing where a scrawny sapling stood before—because they act together and out of love. The climax of A Charlie Brown Christmas starts with a religious reading, but it ends with people coming together and living up to their own best impulses. Where some see the triumph of God over man’s crass nature, I see something more in keeping with Schulz’s gentle humanism: the triumph of man’s better impulses over everything that is short-sighted and petty about him.